David Kim came back to Boca Raton on Sunday, and he got the kind of warm reception and enthusiasm people give long-absent friends when they finally get to see them after many moons have passed. Kim brought his violin and avuncular professionalism to center stage as soloist and conductor with the Symphonia Boca Raton for a program of 19th- and 20th-century Romanticism that included a performance of the Violin Concerto of Felix Mendelssohn. 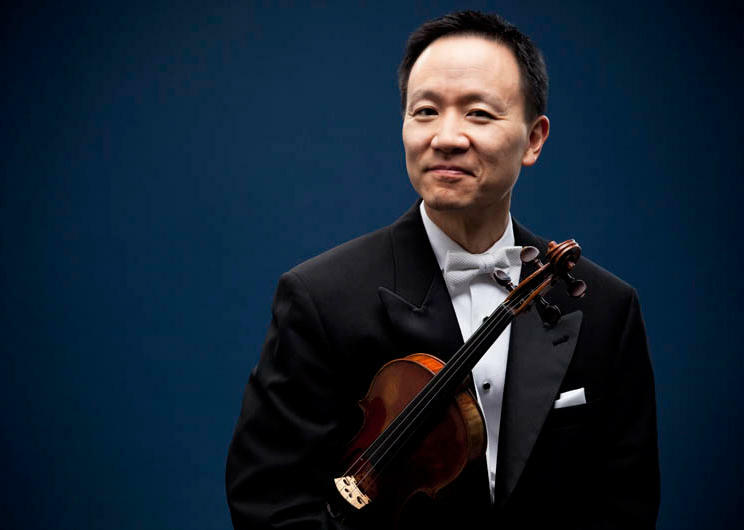 Concertmaster of the Philadelphia Orchestra for the past 19 years — and surely there were many Philadelphia-area people in Sunday’s large audience at the Roberts Theater in western Boca — Kim made his first appearance with the group at a memorable Christmas-themed concert a couple seasons ago and has been welcomed back since. He has a modest, sincere manner on stage and when talking to the audience, and he also likes to get right to the music, as he did Sunday, leading the opening Holberg Suite of Grieg from the concertmaster’s chair, which was on a podium so he could be seen by the rest of the orchestra. Grieg’s suite, originally for piano and then later arranged by the composer for string orchestra, is one of the Norwegian musician’s best-known pieces, a thoroughly charming essay in neoclassicism written for the 200th anniversary of the birth of Ludvig Holberg, the father of modern Danish and Norwegian literature. The Symphonia players sounded comfortable working for Kim, and the music had a warm, rich sound, with dynamics and accents carefully attended to. There were intonation problems in the exposed unison violin passages, and the tempos tended to drag as the piece went on. But there were compensations such as the hearfelt melancholy of the fourth movement (Air) and the overall good-naturedness of the suite, which came across abundantly. The impression one had throughout the afternoon was of a bunch of professionals working hard in a most collegial fashion, moving briskly from one thing into another. And so after the Grieg not much time passed before wind, brass and percussion players had joined the strings and Kim was giving a downbeat with his bow for the hushed E minor murmur that opens the Mendelssohn Violin Concerto (Op. 64). Kim played this with the kind of ensemble-mindedness you would expect from the concertmaster of a major symphony orchestra; that is, with a sound that tends to be collaborative rather than demonstrative. So this was not the performance to look to for barnstorming theatrics. Rather, it was an object lesson in the craft of playing the violin, with a thorough mastery of technique, well-developed musicality and a fine feeling for the style of this music, with one of its feet in Romanticism and the other in the Classical era. One wanted a little more projection, though, in the opening movement and more wit and sparkle in the finale, especially given the intimacy with which Kim played the lovely middle movement. Trying to keep a conductorial hand on things probably had a lot to do with that, because in the second of his solo appearances, Astor Piazzolla’s Oblivion, the effect was quite different. Probably because Piazzolla’s tango can run more easily on autopilot in the accompaniment, Kim was able to concentrate more on making a solo impression, and here he sounded like a much more passionate player. This is not a great piece of music, but when played with conviction, as it was here, it comes across with a compelling sense of sorrow and heartbroken intimacy. The Piazzolla was the preceded on the second half by the Adagio for Strings of Samuel Barber, probably included on this program for ease of assembly and audience familiarity with limited rehearsal time. Its solemn gravity was out of place on this program, and ensemble wasn’t especially good. The concert ended with the Serenade for Strings (in E, Op. 22) of Antonin Dvořák, one of the Czech master’s most genial and attractive works, with a justly famous minor-key Menuetto. As in the Grieg, string sound was pleasingly full and warm, with Dvorak’s memorable melodies played with a strong sense of commitment. And also as in the Grieg, tempos halfway through tended to slow down, and the reading of the work lacked the kind of interpretive details that could have made it more distinctive, despite its many moments of smile-inducing beauty.